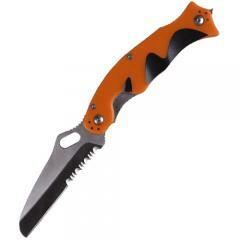 The Double Duty Responder Folding Knife by 5.11 Tactical is designed specifically for EMS professionals. The main blade is a blunt-ended, sheepsfoot design with a combination edge, allowing it to slice easily without the danger of accidentally puncturing a patient. The secondary blade has a serrated edge and blunted tip for cutting through seat belts without endangering the person wearing them. An integrated carbide glass breaker tool serves as a highly effective means for emergency vehicular extractions. Liner locks work to secure the blades in place while in use and prevent accidental injury. The fiberglass-reinforced nylon handle features rubber overmolding and textured scaling for a secure grip in wet or dry conditions, with or without gloves. The reversible pocket clip allows for convenient carry on either side of the body. The included Torx wrench allows for custom modifications.